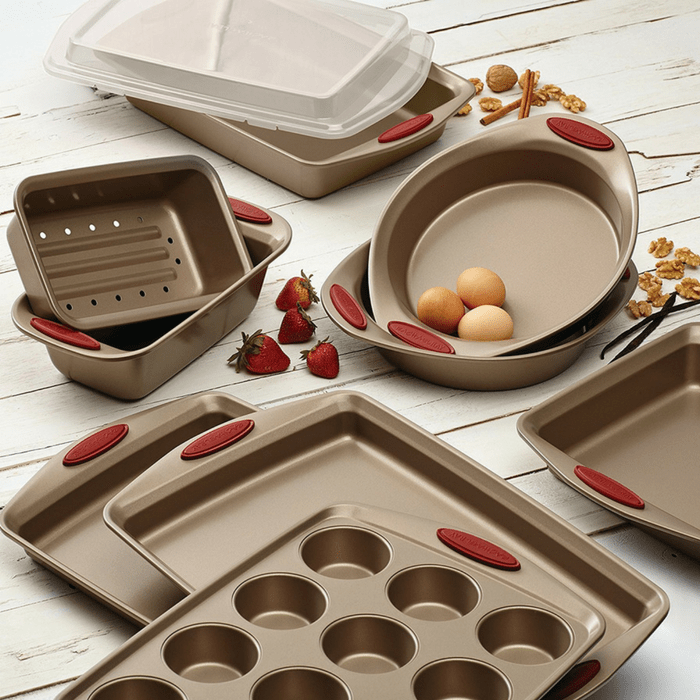 Rachael Ray Bakeware 10-Piece Set Just $64.99! Down From $200! PLUS FREE Shipping! You are here: Home / Great Deals / Amazon Deals / Rachael Ray Bakeware 10-Piece Set Just $64.99! Down From $200! PLUS FREE Shipping! Head over to Amazon to score the Rachael Ray Nonstick Bakeware 10-Piece Set for just $64.99 down from $200 PLUS FREE shipping! From crisp sweet potato-and-parmesan fries to a fast batch of Rach’s pumpkin corn muffins, this Rachael ray Cucina nonstick bakeware 10-piece set is the perfect bakeware team for tasty oven-made treats. This nonstick bakeware is constructed from durable carbon steel that is ready to bake everyday or just once in while, with great results. Long-Lasting, latte-colored nonstick inside and out provides outstanding food release with quick cleanup, and the set includes all the essential shapes for delish baking results. Each baking sheet, cake pan, loaf and muffin pan is made with rolled rims, and is oven safe to 450 Degree F . Heat-Safe silicone grips on the top and bottom of the wide, generous handles provide plenty of solid, comfortable grasp even with your favorite potholders, and add a pop of modern-rustic kitchen color. Best of all this comprehensive bakeware set partners with the complete Cucina collection for even more easy-going kitchen style and functionality. Enjoy easy, delicious roasted and baked foods with the distinctive, durable Rachael ray Cucina nonstick bakeware 10-piece bakeware set in a unique and stylish color.